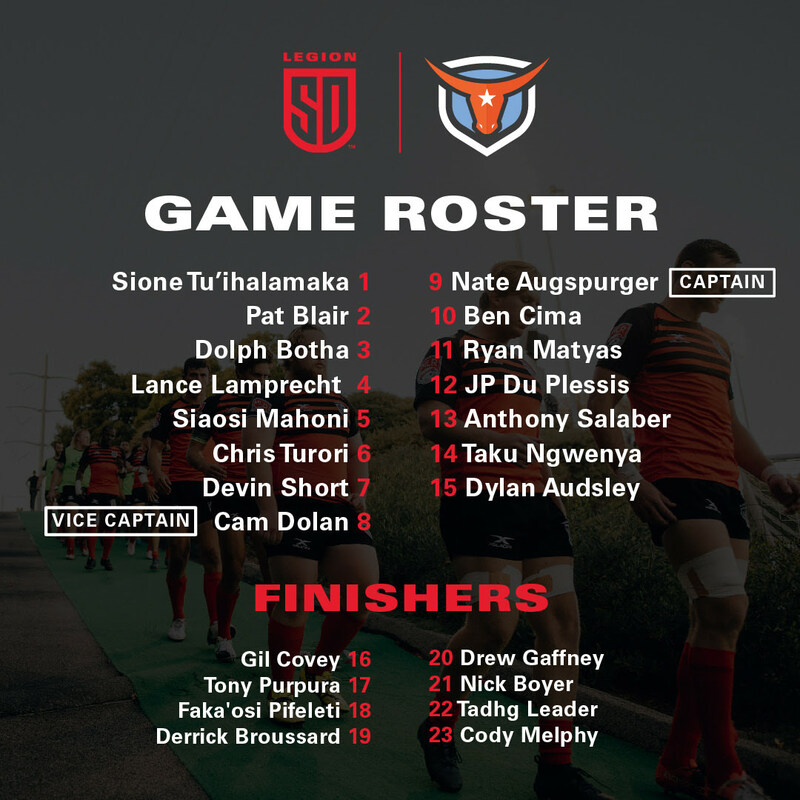 Austin Elite Rugby welcomed the San Diego Legion to Texas and ran them right back out of town. San Diego never showed up to play, they just provided bodies. Austin had their way with the Legion in this match. Timothée Guillimin put the first points of the day on the board with a penalty kick. There was a little bit of confusion for San Diego. Dylan Audsley put a clearance kick downfield but Austin got a hand on it and it fell into Cam Dolan's hands near halfway. The referee called Dolan for offsides because he didn't view Dolan as retreating quick enough. Siaosi Finau put the first try of the day on the board. Austin went with a quick lineout to Hanco Germishuys who offloaded to Finau for the try. 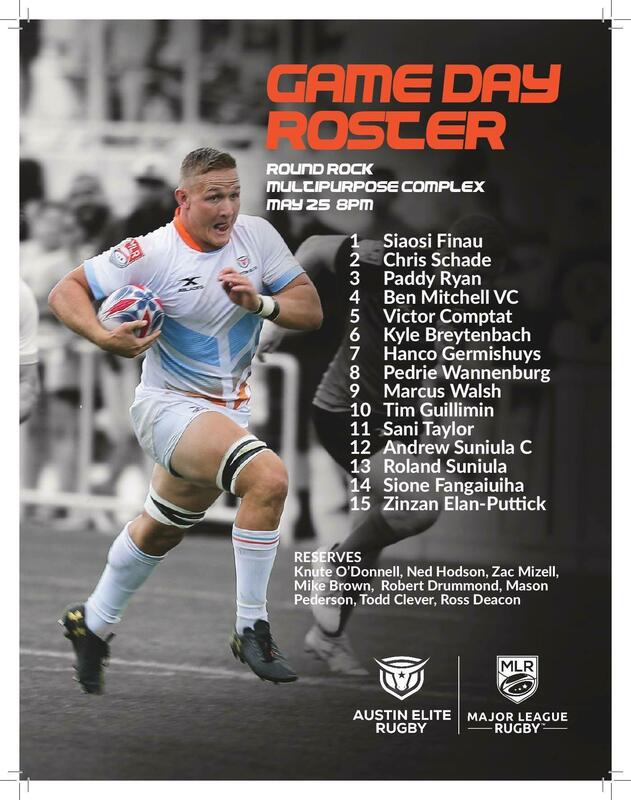 Germishuys added a second try for Austin. Hanco scored against a thin Legion defense who rushed up on the previous phase. Sione Fangaiuiha looked to have a long range try for Austin, but Dylan Audsley was able to come over and make the save, as he forced a knock on right before Fangaiuiha touched down for the try. Hanco Germishuys was sent off just a few minutes before halftime after a high, swinging arm tackle on Nate Augsperger. The first half was kind for Austin, not so much for the Legion. Austin was able to take a 17-0 advantage into halftime by taking advantage of San Diego miscues. The Legion let their scoring chances go by making small mistakes. Knock ons, offsides, and having a free kick touched dead in the in goal area were just some of the San Diego miscues. Timothée Guillimin looked to get the scoring started early in the second half, but his 45+ meter penalty kick hit off the crossbar. Zinzan Elan-Puttick extended the Austin lead after breaking through the Legion defense. Tadhg Leader put a quick through that bounced into Puttick's hands and he went the distance for the try. The Legion finally got on the board 60 minutes into the game. With a penalty advantage, the Legion put in a cross field kick that they recovered and offloaded into the hands of Drew Gaffney for the try. Marcus Walsh put the match out of the reach of the Legion. He used the over-commitment of the Legion defense to score the try. Guillimin converted the try to extend the Elite lead to 31-5. JP Du Plessis had a chance to put more points on the board for the Legion, but was called for knocking on before he could dot down for the try. Austin also had an opportunity to extend their lead further near the end of the match, but the Legion forced them into touch. Austin was this close to having the first ever shut out in Major League Rugby. After being considered one of the worst performing sides in the first half of the 2018 season, the Elite showed why they shouldn't be counted out. Their scrum overpowered the Legion's at points, but they got overpowered themselves at others. The Elite's defense performed admirably and except for just a couple little slip ups, they could've been perfect. The Legion probably have nothing good to take away from this match. Yeah, they scored, but that could be attributed to the fatigue of Austin. They overthrew their lineout almost every time. They knocked on or just plain gave the ball away any time that had any semblance of offense. Their defense came up to fast and left them exposed. It's a tossup between whether or not this performance is worse than their match against Seattle. Austin is back next Friday, June 1st as they host the Utah Warriors in rematch from earlier this season. The Legion have a week to recover before they travel to New Orleans to take on the Gold on Saturday, June 9th.